Lakshmana or Lakshana is the seventh of the Ashtabharya, the eight principal queen-consorts of Hindu God Krishna, an avatar of the God Vishnu and the king of Dwarka - in the Dwapara Yuga (epoch). The Bhagavata Purana mentions Lakshmana, who is endowed with good qualities, as the daughter of an unnamed ruler of the kingdom of Madra. The Padma Purana specifics the name of the king of Madra as Brihatsena. Lakshmana describes Brihatsena to be a good veena player in a dialogue. Some texts give her the epithet Madri or Madraa ("of Madra"). However, the Vishnu Purana includes Lakshmana in the Ashtabharya list, but mentions another queen Madri, who is explicitly mentioned as the princess of Madra. The lineage of Lakshmana is not alluded to in the text. The text also calls her Charuhasini, one with a lovely smile. The Harivamsa also calls her Charuhasini, but is not associated with Madra and another queen called Madri or Subhima is mentioned like the Vishnu Purana. Lakshmana's father had organized a Swayamvara ceremony, in which a bride chooses a groom from assembled suitors. The Bhagavata Purana mentions that Krishna abducts Lakshmana from the swayamvara, just like the bird-man Garuda had stolen the jar of the elixir of life (amrita) from the gods. Another tale describes how Krishna wins Lakshmana in the swayamvara, by acing an archery contest. The kings Jarasandha and Duryodhana miss the target. The Pandava prince and Krishna's cousin Arjuna, described as the best archer at times, missed his aim at the target with the arrow so that Krishna could win the hand of Lakshmana. Arjuna's brother Bhima refused to participate in deference to Krishna. Ultimately, Krishna wins by hitting the target. Krishna and his queens once visited Hastinapur to meet the Pandavas and their common wife Draupadi. The proud and shy Lakshmana tells Draupadi that her marriage was also very exciting and narrates its tale. 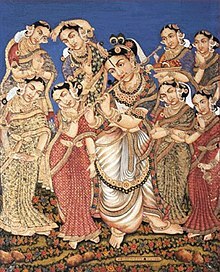 The Bhagavata Purana states that she had ten sons: Praghosha, Gatravan, Simha, Bala, Prabala, Urdhvaga, Mahashakti, Saha, Oja and Aparajita. The Vishnu Purana says that she has many sons headed by Gatravan. The Bhagavata Purana records the wailing of Krishna's queens and their subsequent leap in Krishna's funeral pyre immolating themselves (see sati). The Mausala Parva of the Hindu epic Mahabharata which describes the death of Krishna and end of his race declares that only four committed, others kill themselves by burning themselves alive after being attacked by robbers. ^ Prabhupada. "Bhagavata Purana 10.58.57". Bhaktivedanta Book Trust. ^ Mani, Vettam (1975). Puranic Encyclopaedia: a Comprehensive Dictionary with Special Reference to the Epic and Puranic Literature. Motilal Banarsidass Publishers. p. 448. ISBN 978-0-8426-0822-0. ^ a b Rakosh Das Begamudre; Pōtana (1988). Amrutha of Sreemad Bhagavatha: adapted and translated from the Telugu original of Kavi Bammera Pothana. Rakosh Das Beegamudre. Retrieved 7 February 2013. ^ a b Prabhupada. "Bhagavata Purana 10.61.15". Bhaktivedanta Book Trust. ^ a b c Horace Hayman Wilson (1870). The Vishńu Puráńa: a system of Hindu mythology and tradition. Trübner. pp. 81–3, 107–8. Retrieved 21 February 2013. ^ "Harivamsha Maha Puraaam - Vishnu Parvaharivamsha in the Mahabharata - Vishnuparva Chapter 103 - narration of the Vrishni race". Mahabharata Resources Organization. Retrieved 25 January 2013. ^ "Five Ques married by Krishna". Krishnabook.com. Retrieved 25 January 2013. ^ Aparna Chatterjee (December 10, 2007). "The Ashta-Bharyas". American Chronicle. Retrieved 21 April 2010. This page was last edited on 13 December 2017, at 19:19 (UTC).